These are the first independent tests of the DIY, and the results parallel mine. You could also include the tests by doctors at the University of Michigan as independent “proof of principle,” although they used a different fan and filter. The commonality is that all of the tests have shown that a simple filter and a fan can reduce particulate pollution in the home. Dr. Saint Cyr’s review isn’t all glowing. He rightly notes that the cannon is noisy, which I’ve also written about (decibel counts and comparisons here). Tests show the cannon is still very effective on the lower settings, so I recommend running the cannon on the somewhat quieter settings. And for people who are sensitive to noise, I recommend the quieter Original. Saint Cyr writes that we’re still in the early rounds of our design, and I think that’s right. In fact, we’re working on a new model that keeps the high performance with less noise. I’ll be posting more data on that in the coming months. 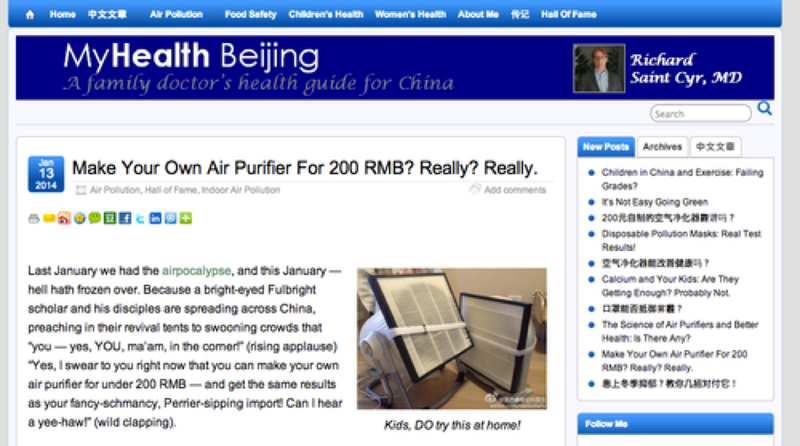 Is a 450RMB DIY filter as effective as a 13,900RMB IQ Air?